I adore San Francisco. I remember it as one of the first “big foreign cities” I ever visited as a child. 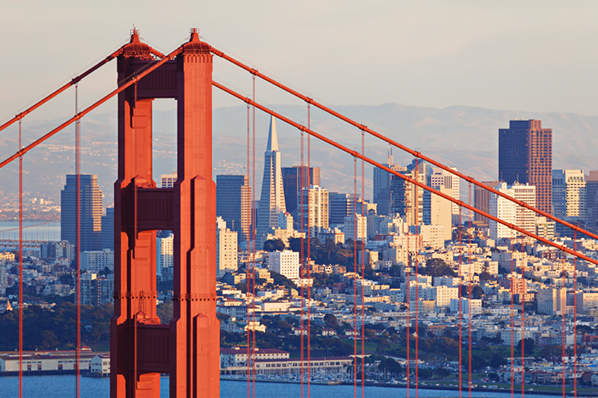 In the summer of 1968 my family moved from London, Ontario to Vancouver and Dad decided to make it a big driving adventure vacation, with a trip to visit family friends who lived in San Francisco, as the penultimate stop. We had a wonderful time en route, but it’s a lot of hours when you are 5 ½ years old, in the middle of the back seat of the family car. By the time we got to Oregon, all I wanted to see was the Golden Gate Bridge which to my mind, was the passage to a magical kingdom. My horribly insensitive family hooted with laughter, and for days afterward, gleefully repeated my mistake to our host family and any San Franciscans they thought would find it amusing. Despite my initial disappointment with this beautiful city’s most famous landmark, I have always looked forward to my visits here, a city of wonderful neighbourhoods, gorgeous views, really good food, including some amazing chocolate shops … and the second oldest US chocolate company – Ghirardelli Chocolate. 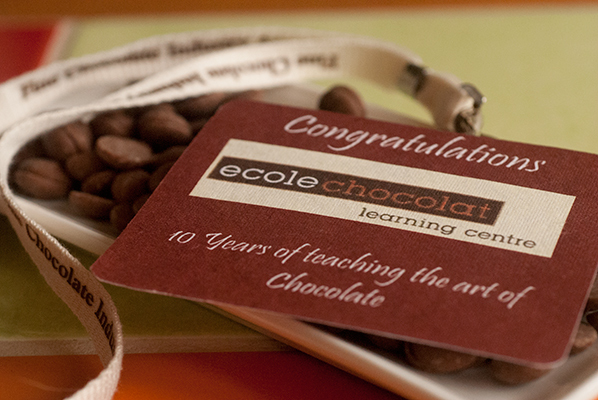 So, I was thrilled when Pam Williams asked me to come along to San Francisco as part of the Ecole Chocolat team, to take part in the celebration of the school’s 10th anniversary year. The centre piece of the weekend was a luncheon, featuring a panel discussion around the theme of “The Future of Flavor, Texture and Presentation in Bonbons and Bars”. For our dessert, and as part of the discussion, each of the panelists was asked to create a bonbon that exemplified their opinions on these themes – now this was a topic I could sink my teeth into. The fabulous Ecole Chocolat tutors and I folded boxes and placed these “mystery bonbons” inside them. We were instructed that these were NOT to be consumed until instructed to by the chefs. “It is very important to know what you want to do when you set out to start your business. I think in our job it’s important to know perfectly, the ingredients, and you need to choose the best ingredients possible. You need to control and respect every ingredient. The techniques are very different and not every recipe works with every type of bonbon, so you may have a terrific recipe for a ganache that will not work when you try to change it to another form, say molded. Temperature, conching of the chocolate, cooking of ingredients – these things dramatically alter the taste of the final product. Before going very original with flavours, it is important to know traditional ingredients and how to use them. Okay, your idea may be original – but is it good? For me, wine is better on the side with the chocolate rather than in it, cheese is good with wine – fois gras is much better with the baguette! You need rigour, passion, precision in your craft. He then introduces to us, a new chocolate that Valrhona has been working on. The story goes: this new chocolate came about because of a happy accident. When Valrhona Chef Frederic Bau (I adore his advice on perfectly emulsified gananche) unintentionally left white chocolate in a bain marie for 10 hours, the chocolate turned blonde and took on a new flavour profile. The resulting new chocolate is called Dulcey (pronounced dool-say). We are given a bonbon, made with Dulcey, which Chef Givre describes as: very traditional, with a soft filling, deglazed with this new chocolate, and infused with a little bit of salt and vanilla. The chocolate itself is composed of sugar, milk powder, cocoa butter. The flavour of the bonbon is biscuit-y, carmelly. It reminds me of Scottish tablet, or shortbread, a buttery flavour, like vanilla fudge, very homey, familiar, yet luxurious in its velvety texture. It is not revolutionary, but it is finely crafted from the best ingredients, and prepared a slightly different way – and it is delicious, and quite a departure from white chocolate. I look forward to trying out Dulcey with some molded chocolates and ganache in my own kitchen – and I may be mistaken – but I actually think it might pair quite nicely with scotch! Chef Paul deBondt, of DeBondt Chocolate, Italy is our next speaker. Pam advises us that, among Paul and Cecilia Iacobelli (his partner/wife)’s many talents and their artistry with chocolate – we MUST look up the amazing things they do with Easter eggs! So, here is a link. Paul tells us he started working in “contemporary chocolate” about 20 years ago. At that time, he says, chocolate was a much more “industrial” type of product – there was a uniformity in the style and flavour of the way chocolate was produced, then people began using higher quality cacao and less sugar, which is now considered “the norm”. They are very light. He tells us they are filled with air! And there are layers. Again imploring us not to bite them, we place them in our mouths, move them around, and let the first layer of pure cocoa mass soften. An intense hit of chocolate. My tongue makes a hole in the bonbon and comes into contact with a layer of air. The aroma, flavour and powerful sensation of orange hits my tongue and nasal passages. My mouth fills with bergamot, but since the centre was isolated from the chocolate, I experienced one layer of taste, before getting the powerful hit of the next. Layers of taste. The centre has been coated in a layer of edible shellac, to keep its integrity until the “moment of revelation”. “It is constructed so that as you eat it, things happen. Not a homogenous flavour sensation from beginning to end. A sequence of things. The future is about time. The orange one has now become the chocolate of the past. Put the pink one in your mouth. No biting! Move it in your mouth. It is a strong sensation, but this is a very small quantity of chocolate. And indeed, a scent and taste of rose fills my entire head, in a most pleasurable hit. Not cloying or overpowering, but, as he says, layers of flavour. I love this idea. Musically speaking, it is like a score with several movements, each one building on the one previous to crescendo in a symphony of tastes and sensations. Chef Bart made a dramatic entrance into the room, just in time to address us, after having been stranded at Heathrow Airport in heavy snow for 24 hours. But chefs are tough and passionate, and he marched straight up to the panelists’ table, and launched into his presentation. “I was asking myself – why is it that there are so many Chinese restaurants, in any city you go to? Because Chinese people, Eastern people are masters at balancing the flavours of sweet and sour, and of texture, and ingredients. And you have to know the origin of your ingredients. Any knowledge I have, I gained because I wanted to try new flavours, so I had to find out about where things like cinnamon and pepper come from. Once you know about these things, you can go and create your own recipes. He has brought, all the way from Belgium, through the freezing weather, a box of exquisite, slender rectangular bonbons, with a delicate sprinkling of sesame seed, on top. As we are admiring their elegant appearance, gives us a hint of what we will be tasting. “Everything that is hard, you taste that last. When you lick an ice cream with caramelized nuts on top, you feel the nuts but you don’t taste them right away – you taste the ice cream, because it is soft. Soft is what we taste first. I didn’t think I had room for another bite of chocolate, but indeed, these long travelled bonbons are a pleasing balance of smooth chocolate and delicate sesame crunch. They have travelled well! Gail Ambrosius, Gail Ambrosius Chocolatier-Madison, US rounded out this illustrious panel of chocolatiers. I was most impressed with her straightforward, intelligence and respect for her customers. She has now been in business for eight years, and has a very loyal following. “I think part of our job is education. People may be afraid your chocolate is expensive, and it is, but I think if you can show them that what you are making is a hand-made product, that it is artisanal, a fine food, they can respect that. People love our open kitchen. They can watch everything, and you have the opportunity to explain to them how the chocolate is made, that there are a lot of hands that make this product for you – it’s not being made by robots. There is trend toward local sourcing. If you can do some nice partnerships involving other local suppliers, I think that’s great. People like to know where their food comes from and they feel good about knowing the back story behind your product. If you know you are going to be using say, peanut butter or fruits, and you know you can work up a partnership with a local grower or supplier, why not? Seasonal flavours are another thing people really like. My customers love to hear that I was out in my garden that morning, picking the mint that goes into my truffles. Gail was asked to join the panel shortly before they began speaking, because it was looking doubtful that Chef Cauwenberghe was going to make it. As I said, chocolatiers are tough and passionate! It was a wonderful opportunity for me to meet and hear some of the most exciting chocolatiers working in the profession today, both on the panel, as well as in the room among the Ecole’s graduates. So many talented, innovative people in one room. It was also wonderful to meet with and talk to some of the Ecole’s new graduates, from the San Francisco area, and across the country, who are looking forward to making their marks in this deliciously difficult business. I plan to keep in touch with them, and look forward to hearing what there next chocolate adventures will be. I came home with many business cards, lots of delicious samples I am currently working my way through, and a rekindled desire to get back into my own kitchen and create. Thanks Pam and Ecole Chocolat for a wonderful chocolate weekend in San Francisco .